Do you know Yukari (Red Perilla) Rice Seasoning? Yukari is tangy blend based on red shiso leaves (red perilla plant). A flexible and flavorful traditional Japanese-style seasoning to sprinkle over rice, pasta and salads. I think most Japanese have it in their kitchen. It is good at everything!!! Here, I will show you super easy recipe using Yukari. 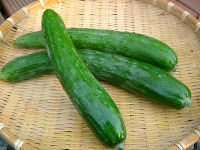 What other ingredient you need is Japanese cucumber. It looks like the picture on the right. You can also use English cucumber or mini cucumber. Those are close to it! 1. Partially strip the cucumber skin with a peeler (it just makes look good so not required), place the plastic wrap over the cucumber and beat them using a rolling pin. 2. 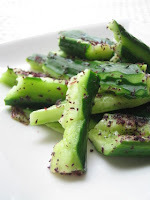 Tear cucumber into pieces, sprinkle Yukari and toss lightly. Yeah, you can use Ume Furikake (sour pickled plum rice seasoning) instead.